A special Thank you to Acacia Publishing for sending me this book to review. Two years ago, Scarlet awoke in the forest alone, afraid, and unable to remember anything. Lost and confused, her life was a mystery...until she met a boy with a familiar voice. Gabriel has a voice from her past, and Scarlet's determined to remember why. She immerses herself in his life only to discover he has a brother he's kept hidden from her: Tristan. Upon meeting Tristan, Scarlet's world becomes even more muddled. While she's instinctively drawn to Gabriel, she's impossibly drawn to Tristan--and confused out of her mind. But as she tries to piece together her history, Scarlet realizes her past...might just be the death of her. I have only moments ago finished Anew. I want more. I need more. What's going to happen?! Cliffhanger!! Let me just say that I was hooked from the first chapter. I knew it was going to be good! 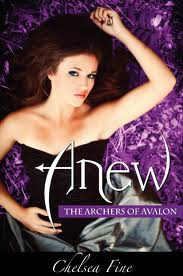 Anew is a book about a girl who awakens with amnesia. She has spent the last 2 yrs of her life trying to remember something, anything. Then one day, at a Kissing Festival, she see's someone she might remember. I like kissing. I like even more that this book starts out at a Kissing Festival. I need to ask my local council if we can have a kissing festival. Scarlet meets two brothers, twins, who know about her past. But, how much are they willing to share? There is a paranormal aspect to this book that is pretty cool. I've not really read anything like this before. Which I love. Vampire, Werwolves and Fallen Angels have been done to death. It is nice to get something original. There has been a curse. It is a little complex and you don't understand it fully until practically the end of the book. And even now I have a ton of questions. There is a love triangle! The heat is on! Nobody's feelings are out in the open in this first installment, so I just can't wait for book 2. I was practically willing Tristan and Scarlet to kiss. JUST DO IT ALREADY!! I am dying to know what happened in the past. WHAT HAPPENED?!?! I liked it guys! It was a quick read, which I love, and I like reading about fresh ideas. I felt the dialogue was believable, and I liked the characters. I'm looking forward to book 2 out this summer (possibly mid July). "Knowing death is nearby gives you a chance to live...deliberately."